Finally, a book (to be published in July) which examines Green policies and their devastating consequences if enacted. Why has it taken so long? I am very pleased to announce a new book from Connor Court Publishing that I have had the privilege to edit, and that should appear in mid July just after the new green Senate is installed in Canberra. 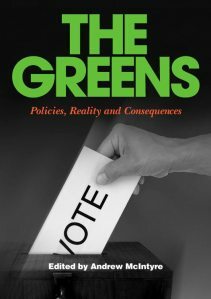 The idea for this book came from an awareness of the alarming void in media analysis of the Greens’ policies at a time when they have been gaining in political strength. This book brings together leading Australian experts who look at a wide range of their policies in detail – from Agriculture to Zionism – to reveal the practical consequences of these policies. The book suggests that the Greens have an uncontrollable urge to spend our money, a mania for legislative and regulatory control – of both institutions and individuals – a disturbing and unwarranted confidence in central planning and a belief that government knows best. Underlying this is a thoroughly naïve understanding of how the real world works. The irony is that the Greens’ policies would not only destroy our economy but actually make the environment worse. For further details of the twenty one contributors and the scope of the Green policies analysed in the book, please go to the Connorcourt website.